It's from the movie Red Eye (2005). Apart from the successful thriller that it is, and upon giving it a second watch, I felt obliged to giving it further credit. It is quite easy to be derailed off a bigger picture when one is captivated by the thrills of an engaging movie. Red Eye follows the close encounter of Lisa and a hostage crisis involving the lives of her own father, and another "father"─the appointed Deputy Secretary to American fatherland's security, that is, Homeland Security™. which was officially put into place after the 9/11 incident. (the final, heaven-like stage of history) in the immanent world. Can you see the co-relations now??? Of course not. The term "conspiracy theory" itself deters you from further investigation. 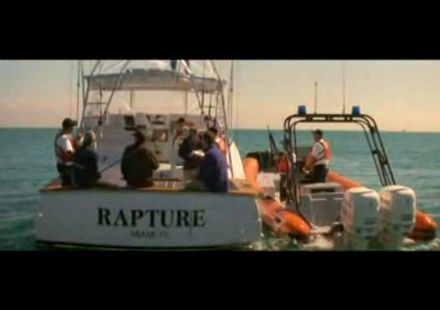 Of course, you cannot see that the fishing boat, purposely named Rapture, is used to fire off from, a mini-missile launcher to kill HS head Keefe and his family. But I'm just saying... right?? Add it up, and you make 12. Plus, a farther cry, recurring references to the sum 9 (or 6), and combinations 911. "Here's what you can do. You can fill out a comment card if you have any more inquiries..."